The major platforms have now released their Jan 15 volumes, with all platforms spot volumes reporting very strong figures, driven by the increased volatility resulting from the SNB surprise move to withdraw the EURCHF 1.20 floor. Reuters Spot: $135bn/day in Jan, up +27.4% on Dec, and unchanged compared to Jan 14 level of $135.1bn/day. Reuters Other Products: $263bn/day in Jan, up +7.8% on Dec, and up 10.6% compared to Jan 14 level of $238bn/day. Reuters total: $398bn/day in Jan, up +13.7% on Dec, and up some +6.8% compared to Jan 14 level of $373bn/day. EBS $129.6bn/day in Jan, up +23.7% on Dec, and +48.1% compared to Jan 14 level of $87.5bn/day. As reported previously, EBS also announced their new HTML5 platform initiatives. Hotspot: $34.3bn/day in Jan, up +23.6% on Dec, and almost unchanged at +0.7% compared to Jan 14 level of $34bln/day, also Hotspot FX has now been sold to BATS Global Trading. 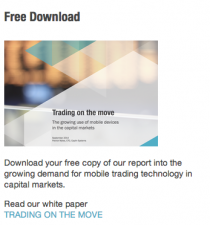 According to Phil Weisberg, global head of FX, Thomson Reuters. 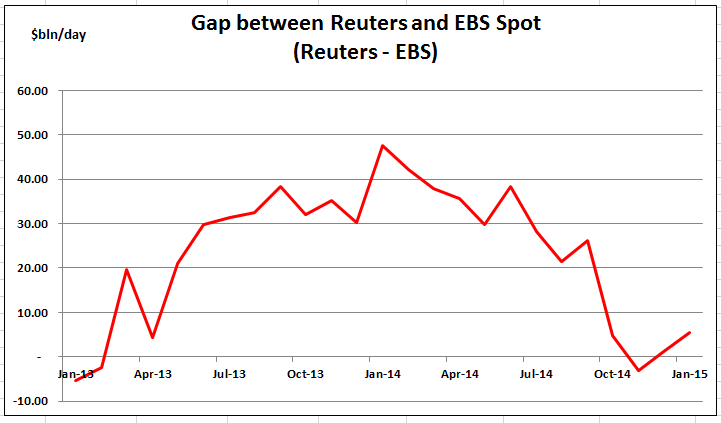 As can be seen from chart below, Reuters clawed back above EBS spot vols in Jan, although will be interesting to see if they can retain that position for long. Although, Michael Spencer of ICAP has talked about the strength of EBSDirect and how it may be starting to cannibalize and may at some point overtake EBSMarkets. Meanwhile, CLS settlement system has reported a +9% rise in average daily value of FX trades settled through their platform in Jan 2015, and some 17.2% higher than in Jan 14. The monthly rise roughly a third the average fall seem in the major platforms. CLS value of instructions submitted: $5,310bln/day, up +9% on the $4,870bln/day in Dec 14, and also almost unchanged at +0.4% compared to Jan 14. 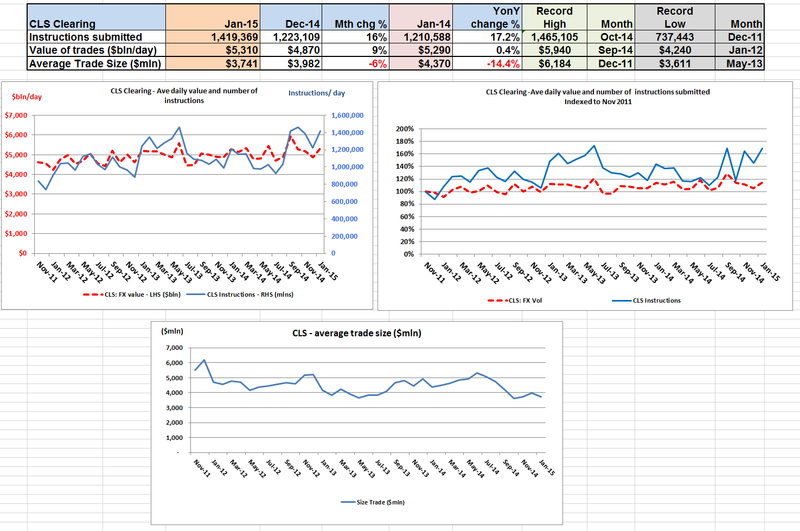 CLS number of instructions submitted: 1,419,369, was up +16% on 1,223,109 in Dec 14, and +17.2% up on Jan 2014 level of 1,210,558. Average Trade size: $3.74mln was down -6% on the $3.98mln in Dec 14 and down -14.4% compared to the $4.37mln in Jan 14.